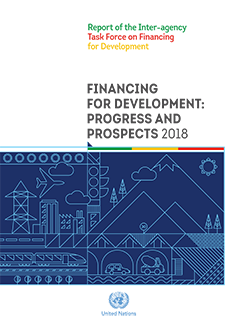 The 2018 report of the Inter-agency Task Force on Financing for Development finds that most types of development financing flows increased in 2017, and that there has been progress across all the action areas of the Addis Ababa Action Agenda. This progress was underpinned by an upturn in the world economy, but at the same time the report warns that risks could derail development progress and structural impediments continue to undermine sustainable development prospects. The 2018 report provides policy options which, if implemented, would put the world on a sustained and sustainable growth and development path. It also examines the financing challenges to the SDGs under in-depth review in 2018 to help assess progress in the means of implementation for goals on water and sanitation, affordable and clean energy, sustainable cities and communities, sustainable production and consumption, and terrestrial ecosystems. The 2018 report is the second substantive assessment of progress in implementing the Financing for Development outcomes and the means of implementation of the Sustainable Development Goals since the adoption of the 2030 Agenda for Sustainable Development and the Addis Ababa Action Agenda. The assessment draws on the expertise, analysis and data from almost 60 agencies and international institutions that make up the Task Force, which is led by UN DESA and includes the World Bank Group, the International Monetary Fund and the World Trade Organisation, as well as UN agencies such as UNCTAD and UNDP.